Abstract: Light prevailing post-frontal N winds allowed challenging but soarable conditions for thermal flying in the midafternoon at Nanakuli if you started early enough. Intro: When McStalker first posted a chat about it being a good day for Nanakuli, I almost retorted back that it would probably be too blown out by the N winds. I would have been wrong. 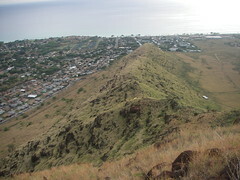 While I was contemplating Makapu'u hearing that Cactus might be doable, JeffMc was checking out Nanakuli from down below. His reports were good enough to get Doug heading out, followed soon by Eric, Chandler, Greg, Dave and finally me. Methods: Doug launched first from low at about 3 pm. From what I heard, conditions that were initially quite promising were just starting to wane and he was concerned that he may have waited too long, but in Doug-style, he worked the bowl of Haleakala until he found the thermal elevator to the top and beyond. The others opted to hike a bit higher for better odds. Chandler launched from mid-launch and hugged the bowl tightly finding nary an uptick. After landing near the dump road he reported there was lift over the open field. Dave hucked off from high? launch and found moderate lift. Jeff made many attempts from mid, but the cycles were just too light to get a good inflation. Eric *patiently* waited on the dump side high launch until finally a cycle came through that was good enough to get off even though by this time all of the air I could feel was coming up from the school side. Meanwhile, Greg set up on the school side at middles and finally I ventured school side at high launch. Results: Doug was able to track with his elevator thermal to all the way over the saddle behind the Haleakala peak. You can see the GoogleEarth of his flight here, but from what I saw he flew along the main ridge for awhile, came back to see what the mortals below were up to, disappeared again for awhile, then came back and danced around at about 2 grand or so with Dave for awhile over the launch area. Eric made the best of what was left in the late day after scooting around to the school side and finding some lift there. Greg and I were simply happy not to have to hike down. Discussion: Clearly Doug's flight was the most successful, but it's hard to gauge how much of that was due to his high skill level and familiarity with Nanakuli versus his earlier timing. By his own observation he thought he might have been just barely catching the last of the desirable conditions. I think from that point on, all pilots were at a disadvantage. What we don't know is what was it like *before* Doug and Jeff got to launch. The inland Waianae NOAA wind sensor switched to a S reading at 11 am and stayed until it switched to N at 3 pm. Dave, who also possesses considerable skill, had to hike higher (which not only takes more effort but more time) and still he did not sky out like Doug did, all presumably because he started just a bit later. Conclusion: Hard as it may be, sometimes you have to commit to a trip to Nanakuli before you know for sure that it's good. With two pilots living out on that side of the island, we have a better chance than ever of being able to make a good bet on a good day out there -- but I think we increase our odds of having a good day if we are able to commit fast and get out there early. Great abstract, Dr. Sandy! Your methods are impeccable and your conclusion is incontrovertible. It sounds like all of the lab animals were treated well enough. I would only add that I would love to see your photos added to the Wind Lines group in Flickr - thanks! Sandy you flying skills as well as your understanding of flying conditions have grown tremendously. Keep up the good work. Here is my take on the whole day. As I was sitting in front of the TV moping about the rainy weather in Kailua a phone call came from my favorite weather observer informing me it was clear, looking good from the dump side and he would likely hike. Now it doesn't take much to motivate me to get out to the west side but I wasn’t waiting around for him to start calling me girl names so I checked in with the boss and hit the road. For me Nanakuli is about 40 minutes from my house and I have actually been from home to launch in less than an hour. On the way I called the usually suspects and got mostly the usual excuses about their manginas aching, dates with wives, etc. but to my surprise I got several calls from new guys and visitors needing some place to be so I gave them directions and instructions to hit me on the radio because I was going to be hard to catch. Rounding the point at Kapolei I noticed what looked like white caps and my heard sank but I wasn’t giving up at this point and kept the hammer down. When I arrived Jeff was just unpacking and I skeptically looked at the gusty lee side conditions. I’d been there before but had the hike in me and booted up. When we reached I was thrilled and I do mean thrilled to a nice breeze blowing in from the dump side. It looked like an epic easy day. I called Dave on the cell and gave him the report. At the low launch it was cycling nicely and I started to unpack. Jeff and Eric arrived and I laughingly remarked about the multiple times I had arrived at the low launch and laid out only to watch it lull off to nothing and have pack it back up and hike to the middle or high launch. It was as if with each word and item removed from my bag the cycles dropped ever so slightly. By the time I was kitted up and ready to take the final step of unfolding the wing it had changed noticeably but there were still some long cycles that showed movement along the whole ridge and I was ready and proud so I unrolled the wing and prepared to launch. By the time I got hooked in and really ready to go the cycles were light with long lulls between them and I was about to break my cardinal rule. IF IT DOESN’T LOOK LIKE YOU COULD RIDGE SOAR KEEP HIKING!!! My first attempt only was sad and when the wing came up it tuned to salute the ocean, then to salute the school, then proceeded to fall out of the sky through itself and in to a crumpled inverted mess about even with the place I chose to perch myself. Eric helped me pick it up and put it place it a bit closer to the trail but there was clearly something amiss with my lines and I had to unhook, pass risers through each other and through themselves, I have no idea how it is possible to have that mess when you never unhooked from the glider but it was. With the sweat running down my face and dripping onto my glasses I reflected on the wisdom of putting on that dry shirt. It also occurred to me that if was arriving to see some one in my position getting ready to huck I would have shot them a caustic remark about hiking to the high launch and kept going. I even remarked to Jeff that I’d probably end up hiking again which I thought was about a 50/50 chance of becoming true. Finally a small cycle came through and I pulled the wing clear of the ground, it wasn’t even enough to keep the wing in the sky and I had to take a couple of steps back and pull it again. This time I powered up and gave me a good pull. I slammed on the brakes to keep it from overshooting and plunged off the edge skimming a rock and twisting my ankle in the process. I was initially below launch but finding lift that was working. I bounced up to middle launch height then back to low launch then go the first real climb of the day. The lift seemed strong and organized but I figured if others were smart they would hike higher, and they did. As they did I got several good climbs. Leaving them to fly out over the dump waiting for the gang to come and join me. After the second one I figured with this strength and no clouds forming over the peak it was likely that you could climb really high so on the next climb I stayed and stayed and drifted to where I know the house thermal lives and continued to climb until I noticed the view was getting a bit hazy. The haze was a cloud forming around me and I left the climb though it was still on. At just over 4500 feet I headed across the valley. My comfortable departing height is 2800 feet which provides enough height on the opposite or back of the valley to be getting organized lift when you arrive. On this crossing I arrived at 3700 feet which is enough to fly over the back on almost any day, but the flats were very shaded and there was no one else in the air so I figured I’d do what I call the circle valley tour and try to catch the gang once they got up. When I arrived at the peak behind launch I was in need of some lift and it was provided. I turned there and then flew back to the house thermal which was still pumping like crazy. Several more turns and I was back in to 3300 and watching Dave launch. Feeling like I had quite the unfair advantage I flew out to the coast and back to arrive at middle launch altitude just as Jeff was getting ready to go. Now the game was afoot and Dave was in the fray with a bit of a height advantage. We searched for lift and found several bubbles that were going up nicely. I think with a bit of commitment you could have again skied out over Haleakala but I’d been flying for an hour or so and it was starting to look like the clouds were starting to fall down the west side of the Waianais so I headed in. Over the valley I blundered into more lift and couldn’t resist turning over the baseball field. Dave came to join me and we climbed together in about 200 up until it was clear it was all going up and I again glimpsed the clouds falling down the Waianais but with lift every where it was going to take some doing to get down. My first B-line stall with the T-3. I pulled it and the decent rate was remarkable, looking up there was less glider over head than I have ever seen and what could only be described as a ribbon. Several seconds later I was down at Daves height and let it out only to find smooth 200 up again. Back to the B-lines. Once below middle launch height it was still lifty but down and I just hung in the valley until low enough to get into the baseball field. 2. Don’t launch with a preset mind set on where the lift will be just feel it out and go where it feels the best. On this day it was away from the hill. Was that thermal on the other side of the valley at the place you guys call the "pyramid"? No it was just the house thermal which I think most of the thermals feed into. I think the one from the gully meets with ones moving up the 3 spines (including the one from the back of the valley). It is usually very sporty but often smooths out quite nicely once it gains sufficient altitude over the top. The thermal on the other side of the valley was over the antennas, a bit further back than the pyramid.